Last time we surveyed the UK’s live and on-demand Internet TV landscape (back in July 07), it was a bare-bones affair. The BBC’s iPlayer was Windows-only and hadn’t yet launched out of private beta, while rival broadcaster offerings were lacking content and, like the iPlayer itself, crippled by DRM and the need to install additional and sometimes conflicting software. Today, TV watching Brits are spoilt with choice when it comes to live and on-demand online from the 6 main UK broadcasters, along with a number of aggregators, including the newly launched SeeSaw, the closest yet to the US Hulu. BBC iPlayer has the most helpfully laid out video on demand site in the UK. However, the newer version of the site (currently on show at http://beta.bbc.co.uk/iplayer/) adds to this with an impressive new design. As ever, there is access to a TV schedule so you can find what was on when, for each channel. The front page of the site has a small section that displayes featured programmes in each genre. However, clicking the “Show All” button takes you to a full listing for that genre. Down the side category pages are a list of all categories, which when clicked expand to show a list of sub-categories, and how many programmes are in each. Each of these pages have options to list programmes by how recently they were broadcast, or as a full A-Z list. The breadth of BBC iPlayer content is strong, all of the BBC’s television and radio channels are covered, each offering 12 major categories of content. Unfortunately, all content is time limited. iPlayer touts itself as catching up on the last 7 days of TV. In many cases, the 7 day limit actually stretches as far as a month, but there is still a time limit, leaving no back-catalogue material available unless it’s repeated on broadcast TV. 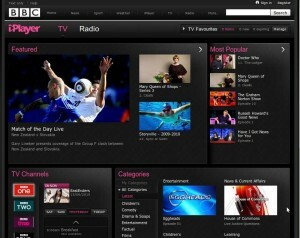 The new version of iPlayer introduces personal and social features. By creating an account, iPlayer learns to suggest programmes you might like based on your viewing habits and which programmes you have selected as a favourite. You can also link your account to Facebook and Twitter, iPlayer will then compare your friends list to its own member list and works out if anyone you follow is also a member. Then, any time someone uses the ‘Recommend’ link on a particular programme, that programme is sent to the recommendation list of anyone that iPlayer has linked to you to via social networks. There isn’t a simple way to send links from iPlayer to social networks, but the web player does provide a short-code URL that also supports deep-linking to specific points in time; that URL can then be pasted any where you like. The web-based flash player is a fairly standard set up. There’s a full screen and large/small toggle. There’s a button for popping the player out into a window of its own. However, the popped out player has no size toggle and appears to have more video compression. A very welcome feature is a button to activate subtitles, to increase accessibility. Beneath the flash player, there are links to display programme information, and to download the programme via the Adobe Air desktop application. The controls found in the web based player are also found in the desktop player. BBC iPlayer is available on a range other platforms too. There are iPlayer applications on both the PS3 and Wii games consoles. Official support for mobile phones is slim, but include iPhone and iPod Touch, and flagship Nokia phones; the official list can be found here. So far, this doesn’t include Android, although we’ve reported on an unofficial application. For Nokia owners who don’t have a supported phone, there is also an unofficial streaming-only application here. 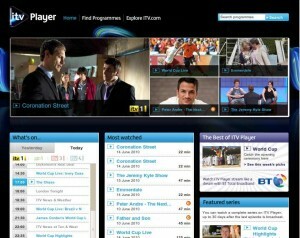 ITVPlayer provides access to content from all four of its channels: ITV1, ITV2, ITV3, ITV4. The content includes both content made in the and imported from the U.S.A. There is no back-catalogue material however, and recent programmes are only available for up to a month. ITVPlayer’s website is well laid out. There isn’t a great deal of content so, and so it’s easy to organise. The front page provides a list of the most popular programmes, along with a list of programmes that were broadcasted ‘Today’ and ‘Yesterday’, with featured content taking pride of place above everything else. Clicking the ‘Find Programmes’ link allows the user list content by either: by channel, full A-Z, or by broadcast date. The flash player for ITVPlayer is pretty straight forward, with buttons for full screen and ‘Lights out’. Being a part of a commercial venture, ITVPlayer has adverts in its content, and these are helpfully marked in the video timeline. Also, while dragging the timeline marker to a new position, it helpfully shows the time that it is being moved to. There is a full A-Z list of 4oD content here. 4oD always has a month’s woth of catch up material, but also have a supply of back catalogue material. They also show some imported content, e.g. The Daily Show with Jon Stewart. Although it seems to be rather hit & miss as to what they can and can’t show. 4oD’s website has a pleasingly ‘clean’ design. The front page makes catch-up material easy to find by use of a sliding calendar; clicking on a date alters the programme list, below, for content broadcast on that day. Content discovery is aided by a large animated header on the main page. Programmes are shown in an iTunes-like cover flow style, and can be filtered by popularity, or even number of BAFTA nominations! However, beyond the front page, things start to get confusing. In the top-right of each page there is a small box titled “Explore” with links to Comedy, Drama, Documataries, Film4, News and See All. The latter links leads to a page with a longer list of categories. However, this is not the full list of categories on 4oD. A full list isn’t shown until the user clicks through to one of those categories, or an individual programme. Then, the list is at the bottom of the right hand column. A full A-Z listing of 4oD content is available, but the link to get there is rather obscure. 4oD has a search box, which helpfully has auto-completion. It is at the bottom-right of this search box that one can find the full A-Z listing, “See All”. The 4oD flash player is a rather basic affair. There are extra controls for subtitles and full screen mode, no lights out mode though. Before a programme begins there are two unskippable pre-roll adverts. Skipping along the timeline works well, and there is a marker in the middle to indicate more adverts, and skipping past this marker triggers two more adverts before the programme continues. Demand Five provides a catch up service to Channel Five, Fiver, and Five USA. On first impressions, Demand Five’s website looks well laid out and simple to use. From the main page, there are clear links to both: an A-Z list of the 80 shows they offer, and to their TV schedule. The TV schedule interface is very well done. A colour coded grid is presented, with days of the week running horizontally, and time of day scrolling vertically, and a calendar pop-out is available to navigate to earlier dates too. Unavailable shows are greyed out. Confusingly, viewers have to click through to Demand Five’s Watch Now page to see shows listed by genre. Above the genre listings are links offering to display shows, in flash based cover-flow style, based on either: “New”, “Popular”, “Recommended” or “Free”. However, these lists are not comprehensive, for example there is more free content than listed through the Free link. This means there is no comprehensive list of free content on Demand Five, which leaves you unprepared as to whether you’ll have to pay to watch a particular show. Demand Five’s flash player is fairly basic, but aesthetically pleasing. All shows have two pre-roll adverts, and two more adverts for every 15 minutes of TV. Adverts cannot be skipped and are clearly marked on the flash player time line. Other controls on the flash player include full screen and a rewind button. The latter is something of a gimmick when you can just drag the time-slider. Each player page has a set of common social network links for sharing links to each episode. Streaming performance isn’t always satisfactory on Demand Five. There are time when streams will suffer from buffering pauses, while other sites that offer Five’s content, e.g. SeeSaw, can play back the same content smoothly. Seesaw has access to all of the material available on 4oD and Demand5. It also has a limited selection of material from BBC WorldWide, plus a selection of individual deals for content that has been seen on ITV, including “Doc Martin” and “Footballers Wives”. Finally, Seesaw has sports deals for the Olympics and 2010 World Cup. Seesaw’s site has a clean design that makes it straight forward to find what you want. Three links at the top provide drop down lists of links. The first is “TV”, which offers a link to each of the last seven days of TV, and a list of the three video services they provide: 4oD, Demand5, and BBC World. The next link gives a drop down menu of links to their full A-Z list of programmes. Finally there is a drop down list of categories. The user interface for catchup material has improved a lot. The main catchup page has links to everyday of the past week, which are further split into morning and afternoon. In addition, there is a drop down calendar for going back a month. Back catalogue material is found by either selecting a channel of genre. It’s difficult to know which series are available in the back catalogue sections. If there is something you particularly want to find, it’s best to use the search box, which suggests titles as you type. The SeeSaw flash player is one of the few VoD players to have quality settings (low, medium, high), to allow the viewer some control in getting the smoothest viewing experience. All programmes on SeeSaw have adverts throughout, much like broadcast TV, and these are clearly marked on the player’s time line. SeeSaw also has a range of premium content for rental. MSN video has over 1000 hours of content. There is a range of small, seemingly random, clips in various categories, along with movie trailers and interviews. However the biggest section is its full TV series section. There’s no short way to sum up the TV content on MSN Video (so see their A-Z), but it does include a selection of content from BBC WorldWide, and independent TV producers, covering series like “Doc Martin”, “Hustle”, “This Life”, “Andromeda” and “MutantX”. MSN Video is well organised with plenty of video categories, and sub-categories, along with a full A-Z of all its 107 TV shows. The clips section is quite confusing with several sub-categories, such as “Celebrity”, “TV Clips”, and “MSN Originals” all sharing content. A-Z lists for each TV genre are available, but confusingly not available via the genre page. Rather, the user must click “Browser all TV”, then chose vertical lists of genres, rather than the horizontal list of genres. The player is a standard Flash affair with full screen and “lights out” features. There is also a SilverLight version for Windows user with suitable browser plugins. TVCatchup offers most (not all) of current UK Freeview TV channels for live streaming, and Freview radio channels are currently in beta. Later this year, they hope to add the ability to record live streams to your hard drive. 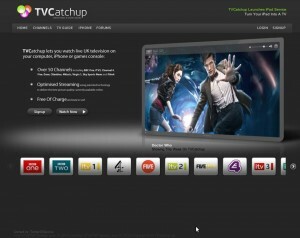 TVCatchup is different in that it (currently) only offers live streams of Freeview (UK Free to air) channels. Therefore the site is quite simple to navigate, you can simply select which channel to view, or view an EPG like page to see the titles of everything that’s currently being streamed. The player is flash based, with option for full screen and adjusting the picture’s aspect ratio. The player can also bring up an overlay of all the available channels, to allow the user to change channels without having to click away onto another page. TVCatchup have recently added low and high qualities so that viewers can make the most of their internet connection. TVCatchup has always supported the iPhone, but they have an open beta of the service for all other smartphone platforms too. Blinkbox has a wide selection of TV series and movies. Although some TV series have a strange selection of seasons. For example, only the first two seasons of BattleStar Galactica are available, and only the fourth seasons of the new Doctor Who series is available. In addition to watching content in a browser, Blinkbox provides a download client so that bought or rented content can be downloaded and viewed offline. However, the video format is Windows Media (WMV), along with Windows DRM, which requires at least version 11 of Windows Media player, and an internet connection is required to obtain the viewing license. Downloads playback well and look like full DVD quality. Rather disturbingly, Blinkbox’s FAQ has a question “I can’t watch the title I bought anymore. Why?” to which the answer is “Due to licensing restrictions, some titles may become unavailable for Watch Online on blinkbox.com for an unspecified period of time.”. Content on Blinkbox is separated into TV or Movie content. Each section has a navigation column on the left with sub-categories for genre, studio, release date. In addition to those, there are also links to filter down to content available to buy, or to rent, and also a price filter. All of which provide useful ways to drill down to the sort of content that you want. Blinkbox’s flash player has settings for high, medium, and low quality. Audio quality noticeably poor on medium & low. Also has picture settings for small, large and full screen. High quality looks impressive, with near-DVD quality. Timeline has markers for program chapters, and skipping to random places with mouse works well. YouTube now offers UK TV shows from Channel Five (“Demand Five“) and Channel 4 (“4oD“); along with limited news from ITN. The presentation leaves something to be desired. While the main Youtube TV Shows page has links to genres, and to TV from today and yesterday. Fortunately, individual TV series have dated lists of episodes to help finding what you want. However, the overall design on all pages does not lend itself well to presenting a generalised catchup interface. However, seeing as Youtube is powered by Google, searching for TV shows directly should always yield useful results. Being on Youtube grants all this content the same benefits as any other Youtube video. Such as social linking, full screen mode, and deep linking. Other features like closed captions, player size, and quality settings depending on the source material. Since 40D and Demand Five are commercial ventures there are adverts, and these are also clearly marked within the Youtube flash player. While YouTube has its well-known mobile site, m.youtube.com, it does not include coverage of any of the full-length TV shows offered on YouTube TV Shows section. Subscription-based access to the satellite broadcaster’s line up of premium channels, including Sky Sports and Sky One. Access is also available via Microsoft’s XBox 360. Thanks Jeff. I agree, David did a great job.